In May 2014, Norm got to go to Japan with the same good friends who previously took him to Ireland, Scotland, London, and Paris! They are quite the travelers… on this trip, Norm got to visit Tokyo, Nikko, Matsumoto, and Nagano. It doesn’t snow often in Norm’s hometown of Seattle, but it did this year! It only lasted for 2 days, but Norm braved the cold to go out and play in the middle of the night with his friend Bartholomew, while the snow was still fresh. Brrr! Not perfect, but pretty good for a quick job! In November, Norm went back to Texas – this time to the Dallas/Ft. Worth area. Norm had fun on the plane! After settling in, his first trip was to the Ft. Worth Zoo with his roommate and her mom. Norm got to help hold a big snake! Next up, Norm visited the Dallas Zoo – Norm loves zoos! – where he had some pretty close encounters with his Texas friends. Norm with his friend Tawny on her birthday! Norm’s friend Logan rescues him from an alligator’s jaws! Finally Norm got to go to Medieval Times with his roommate’s family to celebrate his friend Tawny’s 10th birthday. What a great time! Their knight won the whole joust! Norm posing with the red knight – the winner! In September 2013, Norm went with one of us his favorite travel buddies to Missouri for an Army graduation. One more military base visit checked off the list! CW4 Norm the Gnome, reporting for duty! Norm has been taking it easy lately, relaxing at home and enjoying the Seattle sunshine. He’s a bit overwhelmed by the number of photos he has from his trip around Scotland, Ireland, London, and Paris – Norm promises those photos are still coming! The photo processing has been daunting. But in exciting news, Norm recently met his first superhero, BatGnome! Norm and BatGnome hit it off, and Norm was granted the honorary title of Commissioner Norman. Norm is about to hop on a plane and head out to Missouri, and he worries about his roommate when he’s gone. BatGnome is always looking for opportunities to do good things, so when Norm asked if he would move in and watch over Norm’s roommate during Norm’s absences, BatGnome readily agreed. 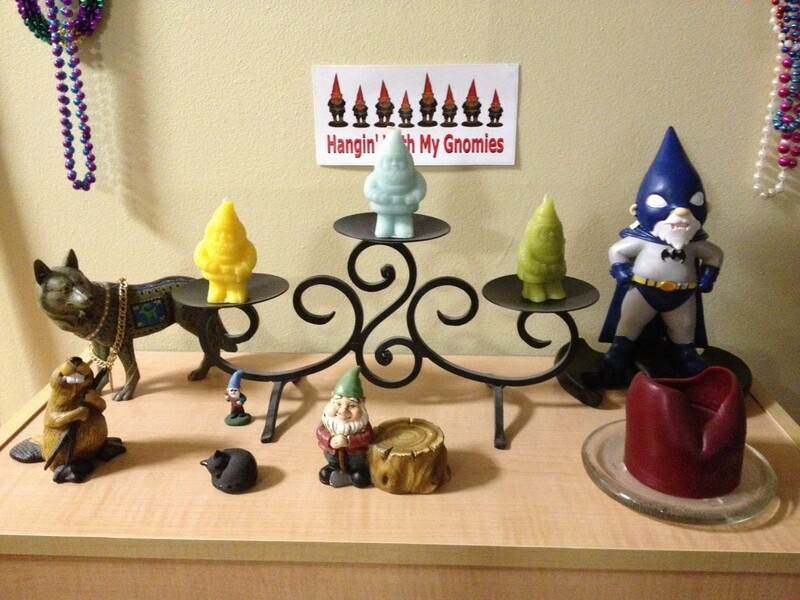 Not only will Norm’s roommate feel safer, but also these new best gnome-buds can hang out between their respective adventures! BatGnome has settled in nicely, and would like everyone to know that as far as Hollywood goes, Adam West was the best Batman. Don’t argue with a gnome. Love BatGnome? 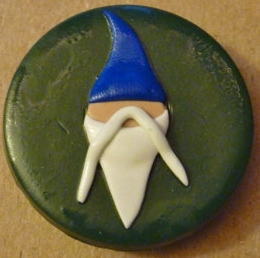 Check him out, along with Captain Gnome & Super Gnome at Parody Gnomes. They have no idea I’m plugging them; I just really love their ideas! Norm decided he loves weddings! Everyone is happy and dressed nicely, and there’s so much love. This wedding in Seattle with his friends tying the knot was loads of fun! Norm with the beautiful bride! Norm is still abroad, but he has an update! Norm went on a trip with a lovely couple to Ireland, Scotland, London, and Paris. You are insanely jealous of Norm, but since one of Norm’s travel companions is practically a professional photographer and both companions are super fun and creative, you know there will be plenty of incredible photos to be shared upon their return. Keep watching Norm’s blog and Facebook for pictures of the next 2 stops: London and Paris! Pip pip, cheerio, mes amis! In January 2013 (Norm knows he’s late with this update), Norm went back to the East Coast for his first wedding. Norm really loves visiting his friends on The Other Coast! Norm’s First Trip Abroad: Amsterdam! At the end of March 2013, two friends were kind enough to let Norm tag along on their trip to Amsterdam! Norm especially enjoyed the Royal Artis Zoo. Some of you may recall that back around Christmas 2012, Norm’s festive 3rd cousin Lloyd moved in. For the most part, Lloyd has been content to be a homebody; however, while Norm was in Amsterdam (photos coming soon! ), Lloyd got the travel bug. Being a holiday junkie, he chose Easter weekend to make his inaugural jaunt, down to Portland, OR. The weather was beautiful – sunny and warm – and Lloyd had a great time wandering around that quirky city! 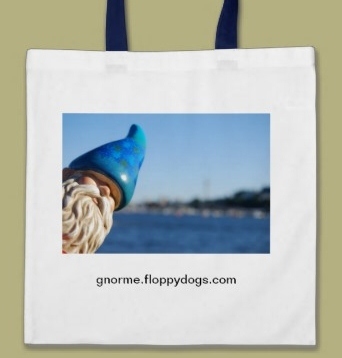 Keychains, tote bags, cards and more.